The Book of Job is the most vexing story in the Bible. In order to test his faith, God permits the righteous Job to suffer at the hands of Satan: Job loses his possessions, endures physical harm, and his offspring are killed. Even worse is that entire exercise stems from a wager between God and Satan over whether the pious Job would succumb and curse God under the pressure of such loss. In “127 Hours,” director Danny Boyle (Slumdog Millionaire) tells the harrowing, heroic tale of Aron Ralston (James Franco), a mountain climber who, in 2003, fell into a chasm while canyoneering through Robbers Roost in Utah and remained trapped for over five days after his right arm became literally caught between a rock and a hard place. Aided by the pulsating score of his Slumdog composer, A.R. Rahman, and a light camera that enables tracking shots in tight places, Boyle splendidly and intimately dramatizes Ralston’s incredible efforts at survival and escape over the titular timeframe. Beyond trying to stave off dehydration and the elements, his biggest battle becomes the one with his own psyche. Water-colored memories of family and the rollercoaster relationship with his ex-girlfriend Rana (Clémence Poésy) soon transition into delusions of escape, a party with two hikers (Kate Mara and Amber Tamblyn) he met earlier in the day, and, in the film’s unquestioned highlight, a radio interview he conducts with himself over the stupidity of not telling anyone where he was planning to hike that day. Throughout the film, Boyle places the viewer in proximity to Ralston’s viewpoint, whether he is diving into underground aquifers or drinking his own urine. Meanwhile, Franco, in an awards-worthy performance, shows Ralston progress through the five stages of grief. Thus, by the time a vision of his unborn son propels Ralston to finally seek a grisly escape, the once unthinkable seems almost inevitable in both his mind and that of the audience. While some may be unprepared for the visceral “money scene” – Boyle uses makeup and sounds effects to make viewers feel every hack through bone and sinew – its explicitness is essential to the film’s impact. 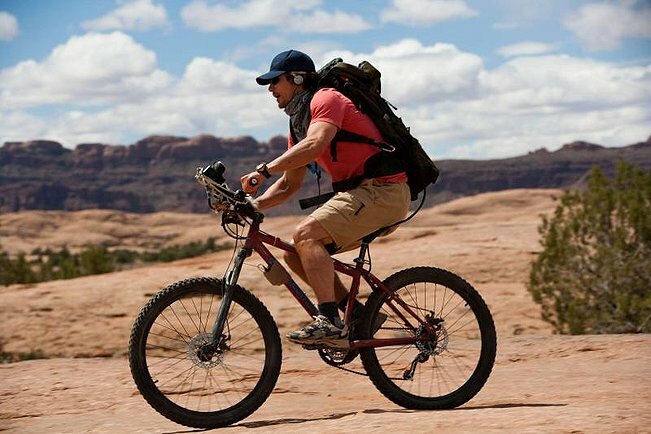 127 Hours succeeds in telling the story of a man who comes to grips with his own fallibility and vulnerability. When Ralston futilely screams for help after first being trapped in his rocky dungeon, Boyle slowly pans the camera out to show the sheer expanse of desolate earth surrounding him. Later, after Ralston climactically climbs out of his would-be catacomb, the heavens part and the music swells as he exclaims “I need help!” to three by-passers. Matters become thornier, however, when Boyle expands the saga into a moral of redemption and salvation. Ralston is couched as a flawed man, but as best I can tell, he’s a wiseacre who doesn’t return his mother’s phone calls as often as he should and was negligent in his breakup with Rana. Otherwise, he appears to be a disarming, devil-may-care thrill-seeker who cares about his family and friends. Like Job, there’s a disconnect between the Ralston’s personal “transgressions” and the consequent tribulations heaped upon him, one that Boyle does not seem to adequately bridge. However, the exegesis of the Book of Job is not necessarily righteousness and mercy, but rather the brutal lesson of man’s helplessness in the face of nature’s whims, whether inflicted at random or at the behest of a supreme being. The finale to Boyle’s film is joyful and life-affirming. But, like Into the Wild and Werner Herzog’s Grizzly Man, 127 Hours is ultimately the story of a prideful man who fancies nature but misapprehends his place in it.